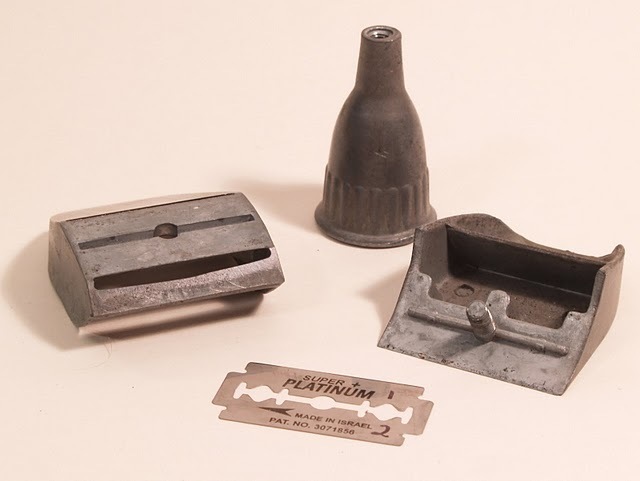 In part one of this blog post, I presented an overview of a variety of razor blade planes. 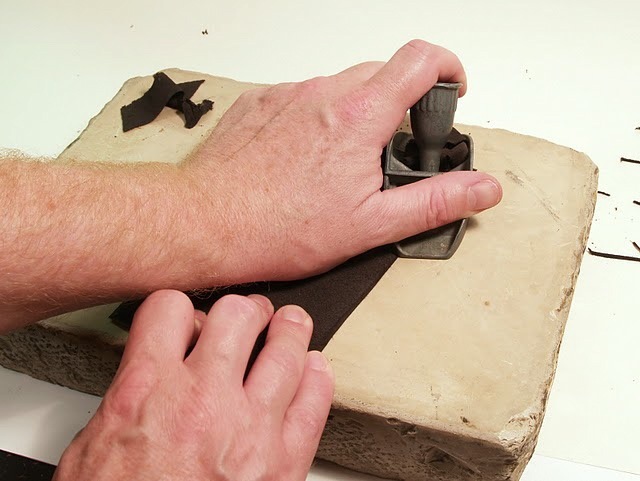 Here, guest blogger Eric Alstrom will share some tips for using these planes to pare bookbinding leather. Eric Alstrom received his MILS in 1989 at the University of Michigan School of Information and Library Studies. After graduation, he apprenticed under James Craven at the University of Michigan’s Bentley Historical Library for four years. He later became Ohio University Library’s Collections Conservator. 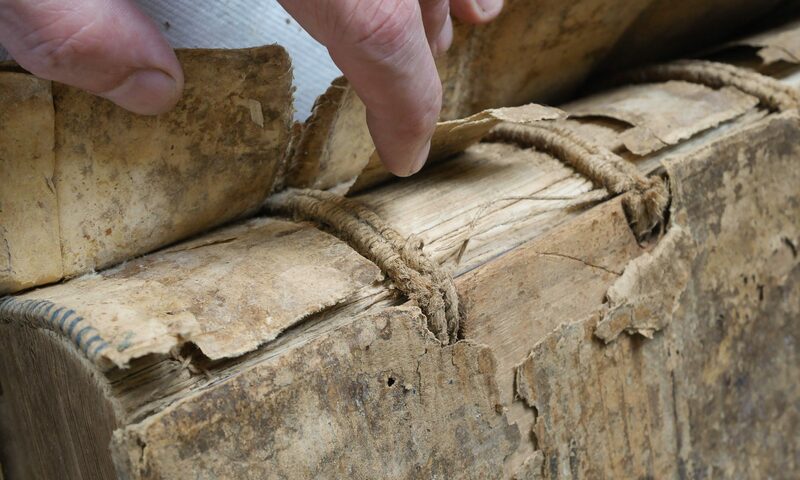 In 1998, Eric moved to New England to become Dartmouth College’s first book conservator. Currently, Eric is Head of Conservation at Michigan State University Libraries’ Wallace Conservation Laboratory. Eric also teaches binding and book arts at regional workshops. While at Dartmouth he expanded the popular Book Arts Workshop, which had focused solely on printing, into binding and artists books. He now teaches book arts and binding for the MSU Residential College for the Arts and Humanities. His design bindings and artists books have been exhibited both nationally and internationally. Eric has been a member of the Guild of Book Workers since 1993, has served on the board of directors since 2002. To view some of Eric’s design bindings, artists books and conservation work, please visit http://webalstrom.ftml.net/bookworks. The Wil-Kro razor blade plane. I was first introduced to the Little Giant when I was serving my apprenticeship with James Craven at the Bentley Historical Library at the University of Michigan. He had a Little Giant and showed me how useful it was for paring leather As I remember (and it has been many years ago), Jim did all his paring with either his paring knife or the Little Giant. In fact, I don’t remember Jim ever using a spokeshave while I was apprenticing with him and the early model Scharfix was rarely used. In the years since my apprenticeship, I have always looked for a Little Giant and garage sales, antique shops and the such. I never was able to find one and adapted my paring technique to include a balsa wood plane (a plane similar to the Little Giant, but made of plastic, rather than metal with a proprietary blade, not a standard razor blade), a spokeshave, and of course my trusty English paring knife. After a conversation with Jeff Peachey at the Tucson GBW Standards in 2010, he said he ran across these from time to time. I asked him to let me know when he next found one because I would gladly buy it. Fortunately, he found one rather quickly and I have been happily paring away since. What he actually found was a Wil-Kro model, which from what I can tell is pretty much identical to the Little Giant. 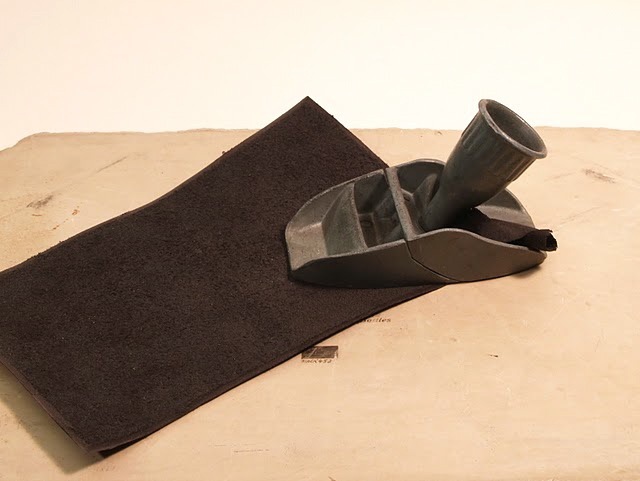 The Wil-Kro can be assembled with the front base shortened, which may be useful for planing curved wood, but it is not suited for leather paring.
. The Wil-Kro razor blade plane taken apart, showing the blade assembly. Note the curved blade bed. I immediately started paring with my Wil-Kro as soon as I got it; I have not modified it at all. A razor blade fits over a screw and onto a ridge so it is held exactly in the same place. The front of the plane that clamps the blade is curved so the blade has a very shallow angle. The blade protrudes evenly beyond the base about .008”, or just under the thickness of three pieces of .003” thick mylar. The blade extends about .008″, roughly the thickness of heavyweight paper. Since double edge razor blades have two edges, I mark mine “1” and “2” so I make sure I don’t use the same edge twice. 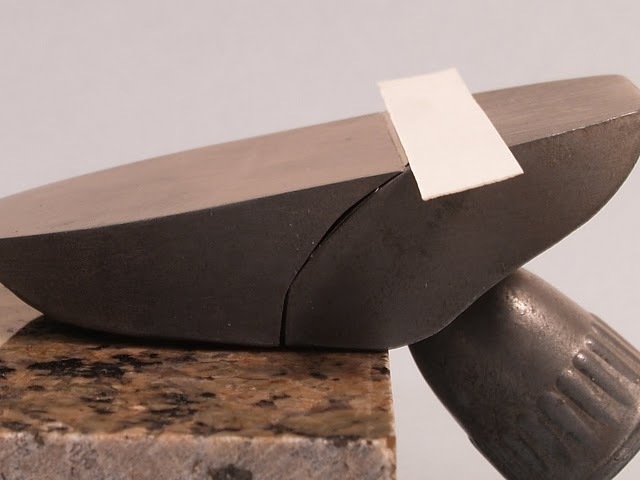 Just like a paring knife or spokeshave, how long a blade lasts really depends on the leather. When the blade no longer glides easily and shaves off the leather, it is time to change. Another sign to look for is if the leather looks more like dust rather than shavings. 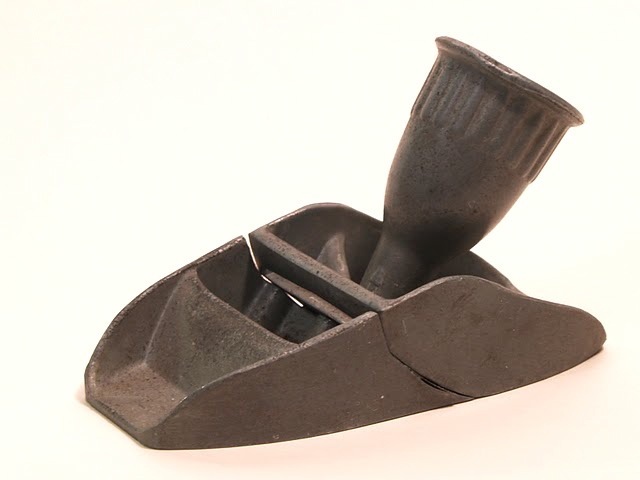 To use a razor blade plane, first, prep the leather – pare all edges before using the razor blade plane, same as if using spokeshave or Scharfix. Use a flat surface which is larger than piece of leather, such as paring stone or other surface used to pare leather. You can clamp (or tape) down the leather or hold it with one hand. For smaller pieces (e.g.. spine and corner pieces), I prefer to hold it down with one hand so I can turn the piece around or change angles easily. This is a big advantage over a spokeshave, which takes two hands to operate. I find the razor blade plane best for smaller areas, such as a piece of leather for a spine.
. Paring with the Wil-Kro razor blade plane. The action is similar to a spokeshave, whereas you hold the plane at approximately 45º to the forward motion, which is called skewing the blade. Don’t apply to much pressure, at least not at first. 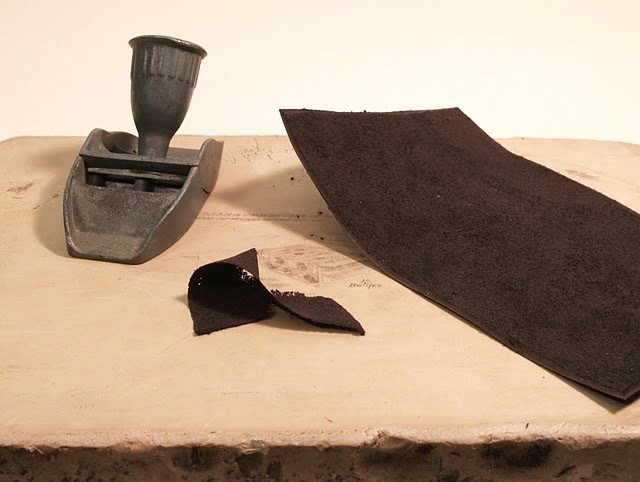 See how the leather will pare: some leather pares almost by itself, other leathers will need more downward pressure to get the blade to shave anything off. I generally work parallel to the spine, not across the skin (except of course when you are paring the fore edges for a full leather binding).
. Some leather parings made with the Wil-Kro. Put the plane on the leather a little bit further back than where you want to start the thinning (similar to a spokeshave). Start to move towards the edge and apply pressure as necessary, depending on toughness of leather. All action is done by pushing the plane away from you (same as spokeshave). I start in the center of the edge I am paring and move my plane gradually towards one outside of the piece of leather then back towards the other edge. Don’t always start this process the same place or you are more likely to have uneven thickness in the leather. For example, when paring along the head for a full-leather binding, I might start midway between the spine and the corner of what will be the turn-in on the back cover. As I pare, I move the plane towards the corner a little bit after each stroke. Once I reach the corner, I slowly work my way back to where I started and then all the way to the spine. I’ll clean out the leather shavings and start again. But this time, I’ll start right next to the spine and work towards the corner and back. Then for a third pass (if needed, always check often! ), I’d start near the corner. As I move towards the edge, I increase the pressure a bit to thin the leather more along the edge. You have to be careful, though, because you can easily shave through the entire thickness. I find the edges I am working parallel to are more vulnerable to this than in the middle. That said, I will sometimes “tip” the plane as I move towards the parallel edge to thin down that edge. I don’t actually tip the plane, but I put more pressure on the side that is adjacent to the edge. I find the razor blade plane very useful tool in the leather paring arsenal. It won’t replace a spokeshave (for efficiently paring large areas) or the Scharfix (for exact work such as onlays and labels) and definitely not the paring knife (for edge paring), but it has its place. For smaller pieces of leather, such as a spine for a leather reback, I find it better than a spokeshave and easier to use. For larger pieces, it can be useful along side the spokeshave for thinning out the corners or along the headcap area. Care must be taken because it can shave through the leather, but with practice and mindfulness, this shouldn’t happen any more often than with any other leather paring tool. The Little Giant (and other similar razor blade planes) aren’t the easiest to find, but they are worth the search. This is exactly what I need! So interesting Jeff, thank you for such interesting, insightful posts! My Little Giant’s screw is slightly but definitely stripped, but I was able to bodge up a short-term repair by putting a narrow strip of leather shaving between the screw post and the wing nut. I could feel that this wouldn’t work for long, though; it was starting to strip further even as I worked. I think, though, that a thick washer between the cap iron and the wing nut would work for a bit longer: the screw seems to be stripped only in the eight of an inch closest to the blade, and the screw sticks out about an eight of an inch from the wing nut, so a washer should move the nut out to an unstripped area. Still, the thin screw of soft metal is clearly the weak point of the Little Giant’s design. The Wilkro’s screw seems a shade larger and more sturdy, so I wondered if they might have cast a steel screw into the body, but on examination it is clear that they threaded a part of the casting, just like the Little Giant. Thanks, Jeff and Eric, for putting this thread up. I still don’t like these tools, but not nearly as much as I did before I had to reevaluate. I’m appreciating them more as well. They take a much more delicate touch, which I’m still getting used to. Stripped threads seem to be a very common problem. The little giant is a standard 10/32 thread, so I’m planning to file the remains of the stud off, retap it and insert a brass stud. It should work…I think. The sole looks to be thin there, maybe 1/8″ thick. I think you will have to drill all the way through and tap all the way through. Hard-soldering the brass as well as tapping it might be a good idea, if it is possible (I don’t know if there would be difficulties in hard-soldering pot metal or aluminum).